We invite you to submit a proposal for a workshop, lecture presentation, panel session, poster presentation or art display. Full instructions. The theme is "NDEs as Rites of Passage" -- Passages to alternate realities, to wisdom and deeper insights, to life transformation, to new understanding about consciousness and the true nature of reality. Presentations from the viewpoint of experiencers, science and spirituality are welcome. Conference Objectives: See also the Save the Date Announcement. Promote disclosure, description and classification of the phenomena associated with NDEs and related experiences that demonstrate rites of passage or significant transitions in the experiencer's life. Identify practices and insights that may help those in the healing professions (doctors, nurses, hospice, chaplains) to support NDErs and others with spiritually transformative experiences. Compare and contrast insights from near-death related phenomena as rites of passage when viewed from the experiencer, scientific and/or spiritual perspectives. Discuss recent research on near-death related phenomena and associated experiences, with an emphasis on these experiences as rites of passage. We welcome proposals for workshops, lecture presentations, panel sessions, poster presentations and art displays that meet one or more of these objectives. 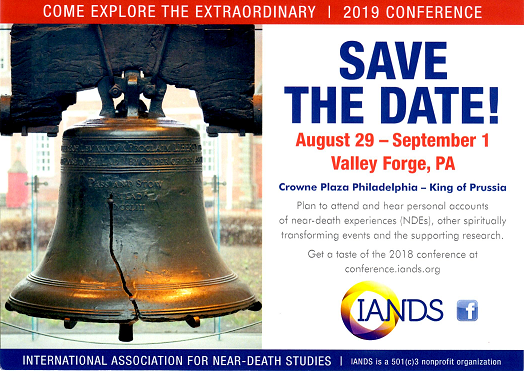 Note: presentations of individual NDE stories will be scheduled on one of the NDEr Panels. Selections to these panels will be made at the conference. If you want to be considered for an NDEr panel, specify that in the abstract. The Objectives, Outline and Degrees sections then do not need to be filled in. To submit a conference presentation proposal , download the following documents. Using the EXAMPLE file as a guide, fill out the Conference Proposal Form and e-mail or mail it to the IANDS Office.